Apartment in a residence 30 m from the beach, with 3 bedrooms, terraces and views on sea/port. Brand new three bedroom apartment in central Agde. *Large villa house in the centre of Agde, ideal holiday rental. A perfect base, but don't rush off! Agde, the old town, as opposed to its younger, brasher neighbour Cap d'Agde, is a wonderful place from which to enjoy France's Mediterranean coast. Close enough for day trips to Spain and the Cote d'Azur, not to mention the great historic towns of Béziers and Carcassonne, the meandering narrow streets and black basalt architecture of Agde itself are worth taking time to enjoy. Much of the town stays faithful to its past, with old world charm evident in the high, shuttered houses and little alleyways that snake around the town. Agde is the second oldest town in France and proud of it! The black sand beaches of Agde are renowned throughout Europe and provide some excellent possibilities for swimming, sunbathing and snorkelling due to the clarity of the water which is often found with volcanic sand beaches. Agde is close, yet not too close, to the lively resort town of Cap d'Agde, a modern purpose built resort with a reputation for a risqué lifestyle. The 'Cap', as it is often referred to, has fabulous sandy beaches, water sports and all the trappings of a top resort, with the notable addition of arguably the most famous Naturist quarter in Europe! If your preference is for a quieter beach, try le Grau-d'Agde, which is found near the seaport entrance of the River Hérault. 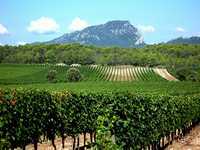 The region of Languedoc Roussillon, and the wine-producing department of the Hérault in particular, is renowned as one of the sunniest parts of France and Agde makes the perfect place in which to relax in the sunshine with a glass of delicious locally grown wine! Travelling to Agde from the UK is remarkably stress free as there are numerous airports within easy reach of the town with flights to and from the UK. The nearest of these is Montpellier but if flying isn't your bag you can take the Eurostar from St Pancras to Paris or Lille, then the TGV to Montpellier, Agde or Béziers. If you are working to a strict budget or looking to buy a château for a few thousand Euros, Agde may not be the place for you. Prices in Agde have risen sharply over the last few years, in keeping with the general trend in the region, which has been one of the fastest growing property markets in France. This, however, also means that any property you do buy here will probably prove to be a wise investment and if your dream is a house on the Mediterranean in a beautiful old town you could do far worse than to start your search in Agde. Do you know Agde better than we do? Do you have photos of Agde? Right on the coast in the south of the Herault department. Access: By Air: Ryanair fly into Montpellier (nearest airport), and there are also UK flights to Carcassonne, Nîmes and Perpignan. By Eurostar Link from St Pancras-Lille/ParisTGV to Montpellier, Agde, Béziers. Interesting fact: Nearby resort of Cap d'Agde is one of the largest and most famous Naturist holiday centres in Europe!